There is no better thrill ride in all of Alaska! 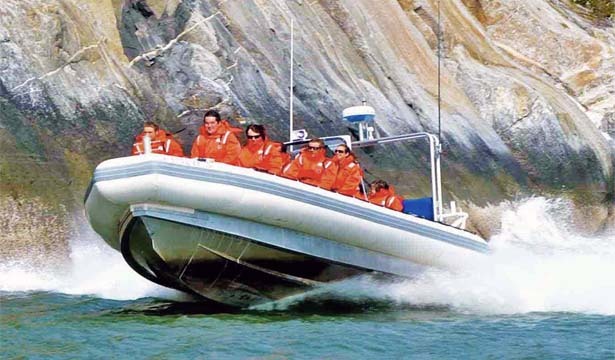 Quench your need for speed in our coast guard approved ocean raft, as we conquer the waves of the deepest fjord in North America. Get up close and personal with towering waterfalls, and keep your eyes peeled for breaching whales, cruising porpoise, and other animals like sea lions and seals. OUr shock absorbing seats provide maximum comfort on the water, and you will be provided with your own fitted exposure suit to keep you warm and cozy in any weather. We are capable of handling large groups, but please book well in advance. Minimum age is 10 years old. Maximum weight is 350 pounds. Pregnant women and persons with neck or back injuries are not allowed, due to the high acitivity level of this Skagway tour.